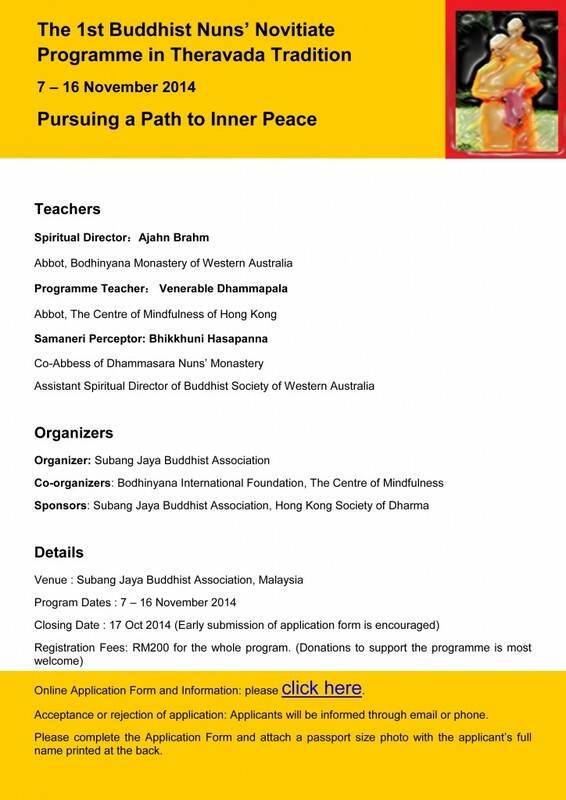 1) SJBA is organising an Intermediate Course on Buddhism from 19 September to 24 October 2014. The course will run for 6 consecutive Fridays from 8.30pm to 10.00pm and will be conducted by Uncle Vijaya, Bro Charlie Chia and Dr Chan Kah Yein. The course will cover Buddhist views on contemporary issues and Buddhist living. All are welcome. The session this Friday (26 Sep) will be conducted by Sis Kah Yein and the topic is “Brahmas of My Heart, Apple of My Eye”. On next Friday (3 Oct), the topic is “Beginning & Ending of the Worlds” by Uncle Vijaya. 2) This year’s Kathina Ceremony will be held on Sunday, 26th October 2014. Kathina is a traditional Buddhist Ceremony started by the Buddha Himself for lay devotees to offer robes and other requisites to the Sangha at the end of Vassa (rainy season). The Ceremony will begin on Kathina Eve (25th October 2014) with Taking The Three Refuges & Five Precepts before the Sangha at 8.00pm followed by Paritta Chanting, Dhamma Talk, Blessings by the Sangha and Sharing of Merits. On Kathina Day, the Ceremony will commence at 8.15am with the Taking of the Three Refuges and Observance of the Five Precepts administered by the Sangha, Offering of Robes and other Requisites, Sharing of Merits and Lunch Dana. A blood donation campaign will also be held on this auspicious day. Please come and join us to perform these meritorious deeds together. 4) This Sunday’s (28/9/14) Dhamma Talk in English (at 10am) is on “Buddhism & Psychology: Calming Mental Proliferation” which will explore the Teaching of the Buddha from a scientific perspective on how mental proliferation (thinking traps) arise, and what we can do to calm mental proliferation and find peace. Our Speaker, Bro. Billy Tan is a Professional Trainer and Business Development Consultant who has trained countless corporate executives and business professionals in more than 20 countries over the past three decades. Bro. Billy is a Certified Master Practitioner of Neuro-Linguistic Programming (NLP), as well as being certified by the International Association of Counselors and Therapists, USA, in Clinical Hypnotherapy. In recent years Bro. Billy has conducted several professional training programs for resident and visiting Monks at the Buddhist Maha Vihara, Brickfields, in the areas of Emotional Intelligence, Communication, Professional Presentation, Public Relations, Community Services, Leadership, and Management. In sharing the Dhamma, Bro. Billy researches discoveries from the fields of Neuroscience and Psychology to present teachings of the Buddha from a scientific perspective. 5) This Sunday’s Dhamma Talk in Mandarin (at 11.45am) is on “Meeting With the Dhamma” by Ven. Dhammapala. Ven. Dhammapala graduated in Pali and Buddhist Studies from the University of Kelaniya, Sri Lanka and received his Doctorate from the University of Hong Kong He has been lecturing in the University of Hong Kong and has presented a number of papers. He is currently the Spritual Director of Buddhistdoor. Vice Chairman of the Hong Kong University Centre of Buddhist Studies Alumini Association and Director of a few Buddhist-based organisations. 这个星期日的讲题是与佛法相会, 讲师是法护法师.法师毕业于斯里兰卡的Kelaniya大学，专注于巴利文和佛教研究。法师也在香港大学获得了博士学位，也在香港大学当过讲师，并呈列了一些论文。他目前是 “Buddhistdoor” 佛门的精神理事。是香港大学， 佛学校友会中心的副主席。也是其他以佛教为基础的组织的理事主任). 1) SJBA is organising an Intermediate Course on Buddhism from 19 September to 24 October 2014. The course will run for 6 consecutive Fridays from 8.30pm to 10.00pm and will be conducted by Uncle Vijaya, Bro Charlie Chia and Dr Chan Kah Yein. The course will cover Buddhist views on contemporary issues and Buddhist living. All are welcome. The first session (19 Sep) will be conducted by Sis Kah Yein and the topic is “Dana, Giving Generously”. 2) SJBA is hosting a Dhamma Talk by Venerable Sujatha on 24 Sept 2014, Wednesday, 8.30pm to 10.00pm. Venerable Sujatha entered the monastery at the age of 11 and graduated from the Subodharama International Monk Training Center. In 1993, he left Sri Lanka for Australia, where he taught meditation and Buddhism at the Sri Lankarama Buddhist Monastery in Brisbane. In 1997, he helped establish the Great Lakes Buddhist Vihara in Southfield, Michigan. In 2002, Venerable Sujatha was invited to start meditation classes at both Congregational Unitarian Church in Woodstock, Illinois and McHenry County College. Soon after, Venerable Sujatha founded the Blue Lotus Buddhist Temple in Woodstock, Illinois, at the premises where the Congregational Unitarian Church once stood. As the Abbot of Blue Lotus Buddhist Temple, Venerable Sujatha travels around USA and abroad to teach the Buddha Dhamma and Meditation, and regularly devotes his time in Sri Lanka in aid of several missionary and charity projects. Venerable Sujatha has been a Buddhist Monk for over 30 years, and is singularly focused on adding more love and bringing happiness in the world. He teaches loving-kindness meditation to people around the globe for all those seeking the art of happiness and contentment. His approach to meditation is deep and profound, yet simple and practical, bringing core Buddhist teachings to everyone in a way that is practical and easy to understand. A joyful, radiant, funny and wildly energetic monk, Venerable Sujatha will help anyone obtain peace and tranquility that can only be found in deep silence. 3) This year’s Kathina Ceremony will be held on Sunday, 26th October 2014. Kathina is a traditional Buddhist Ceremony started by the Buddha Himself for lay devotees to offer robes and other requisites to the Sangha at the end of Vassa (rainy season). 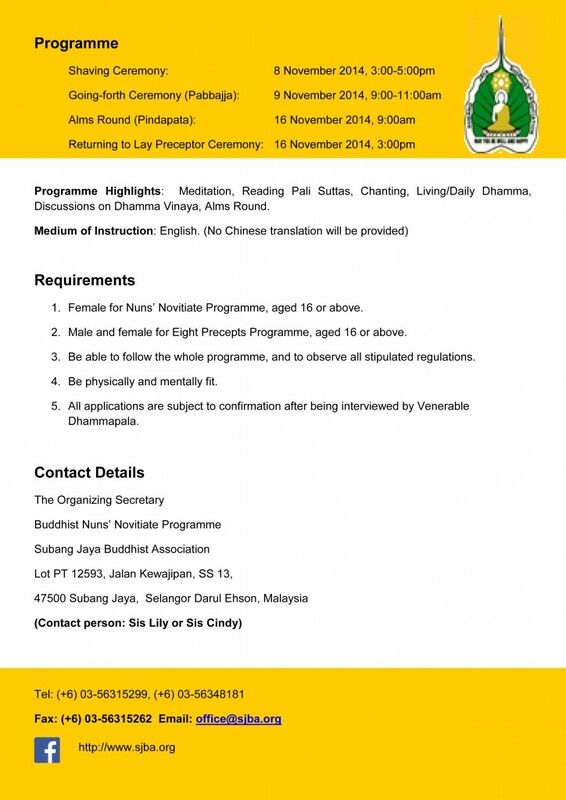 4) Subang Jaya Buddhist Association is co-organising with the Bodhinyana International Foundation, Australia and the Centre of Mindfulness Limited, Hong Kong, the 1st Buddhist Nuns’ Novitiate Programme in the Theravada Tradition on 7–16 November 2014, under the guidance of Bhikkhuni Hasapanna, Venerable Dhammapala with Ajahn Brahm as the Spiritual Director. This Program will be sponsored by SJBA and the Hong Kong Society of Dhamma Supporters but donations towards the costs of running this Novitiate Programme will be most appreciated. Please visit SJBA website or Facebook (as below) for further information and downloading of application forms. 5) This Sunday’s (21/9/14) Dhamma Talk in English (at 10am) will be given by Sayadaw U Rewata (not by Bro Jeff Oliver as announced last week). This Sunday is the birthday of Sayadaw U Rewata. On this day, we invite Sayadaw to teach us the Dhamma and chant the Parittas for our blessings. 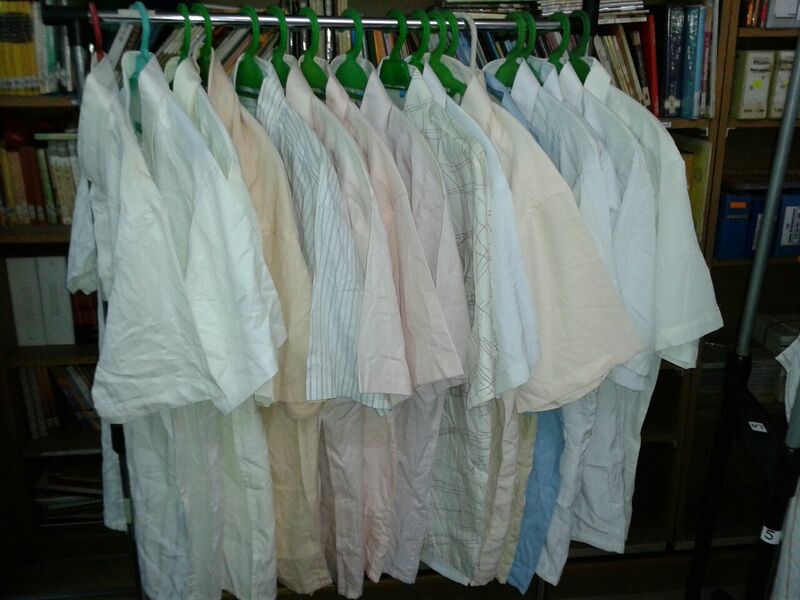 Thereafter, devotees will offer requisites and also a birthday cake for Sayadaw U Rewata followed by lunch dana. All are welcome to join in. 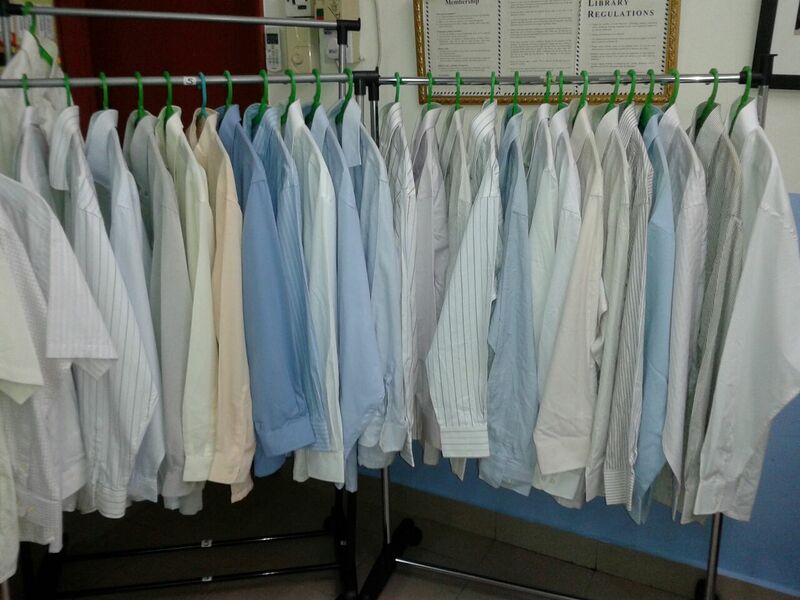 6) This Sunday’s (21/9/14) Dhamma Talk in Mandarin (at 11.30am) is on “Spiritual Friend” by Sis Tan Yee Yong. Sis Tan Yee Yong graduated with Bachelor of Science in Computer Sience and MBA. She obtained MA in Buddhist Studies from IBC, Thailand. She is now a Dhamma committee member of SJBA. 这个星期日的讲题是” 善友”, 讲师是陈玉容居士. 玉容居士持有科学学士学位及商业硕士学位，在商业界工作。她曾经是我们首邦再也佛教会青年组主席，及佛法小组组长 ，在学佛路上， 她持有佛教文凭及国际佛教大学佛教研究文科硕士 。目前她是我们首邦再也佛教会 佛法委会小组成员. 7) SJBA is hosting a Dhamma Talk in Mandarin by Bro Leong Kok Hing related to Buddhist Stamps, this Sunday, 21 Sept, 1.30pm to 3.30pm. Bro Leong has previously served as the President and Secretary of YBAM for 16 years. He has held many portfolios in Buddhist societies such as the Chief Editor of Buddhist Digest, the Assistant Secretary of World Fellowship of Buddhist Youth, Fo Guang International Youth Director, Vice Principal of International Buddhist College and etc. 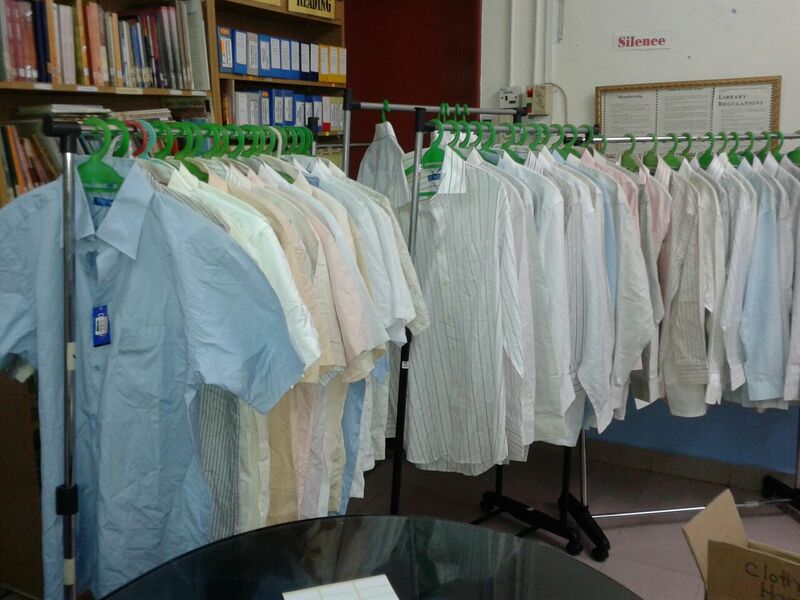 At present, he is managing General Affairs of International Buddhist College and Phor Tay Chinese Secondary School in Penang. He was conferred with the Excellent Youth Award and Youth Leader Award from the Ministry of Youth. He has been collecting stamps which has Buddhist themes for 30 years. In the eighties, his stamps have been displayed in some major Buddhist exhibitions in Penang and Kuala Lumpur with “Buddhist Travel”as its theme. He was also invited for his solo in 1990, 1992 in Fo Guang Temple at Singapore and Taiwan. 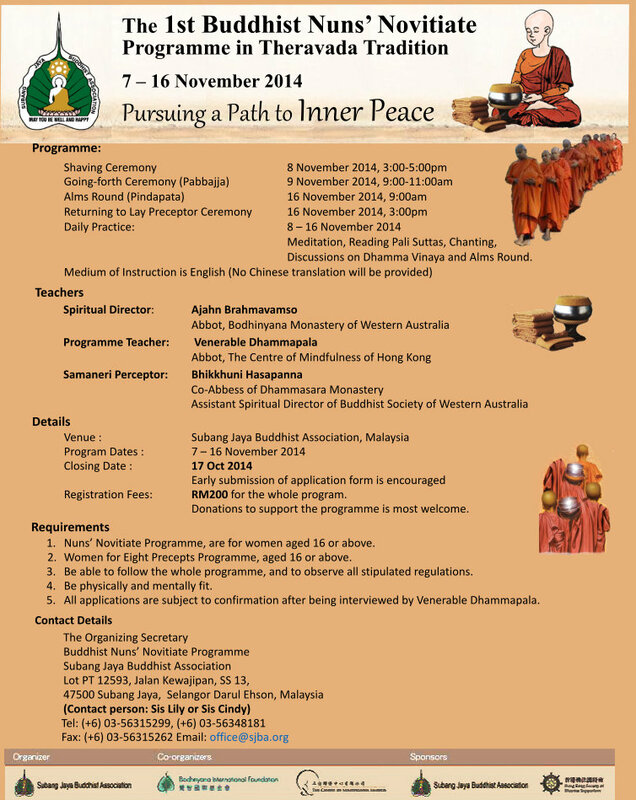 1) SJBA is organising an Intermediate Course on Buddhism from 19 September to 24 October 2014. The course will run for 6 consecutive Fridays from 8.30pm to 10.00pm and will be conducted by Uncle Vijaya, Bro Charlie Chia and Dr Chan Kah Yein. The course will cover Buddhist views on contemporary issues and Buddhist living. All are welcome. 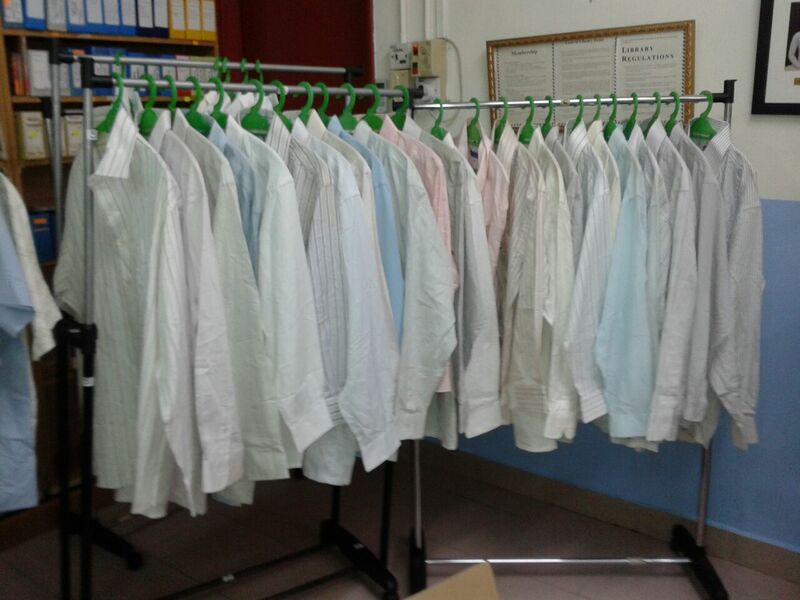 Please contact Sis Cindy at 03-56348181 for further details. 2) There will be Dhamma Talk by Bro. Jeff Oliver on 21 Sept, 10am at SJBA Shrine Hall. Bro Jeff Oliver is a dynamic and creative meditation teacher from Australia. He has been practicing Vipassana Meditation for about 19 years, eight of which he was ordained as a Buddhist Monk in the Burmese tradition. Jeff has shared practical life skills and ‘mind management’ in many areas of the world including Africa, Asia, Australia and Europe including Turkey. Jeff’s teachings are based on both ancient and modern ways of mind training especially, such as appreciation, forgiveness, “metta” unconditional love, concentration, awareness and wisdom. Basically, Jeff is offering us a ‘toolbox’ of techniques to be used both in formal, intensive meditation and in any situation during our busy and complicated daily life. His style is open, approachable, friendly and gentle yet very effective for the modern seeker of truth. 3) SJBA is hosting a Dhamma Talk in Mandarin by Bro Leong Kok Hing related to Buddhist Stamps, on 21 Sept, 1.30pm to 3.30pm. Bro Leong has previously served as the President and Secretary of YBAM for 16 years. He has held many portfolios in Buddhist societies such as the Chief Editor of Buddhist Digest, the Assistant Secretary of World Fellowship of Buddhist Youth, Fo Guang International Youth Director, Vice Principal of International Buddhist College and etc. At present, he is managing General Affairs of International Buddhist College and Phor Tay Chinese Secondary School in Penang. He was conferred with the Excellent Youth Award and Youth Leader Award from the Ministry of Youth. He has been collecting stamps which has Buddhist themes for 30 years. In the eighties, his stamps have been displayed in some major Buddhist exhibitions in Penang and Kuala Lumpur with “Buddhist Travel”as its theme. He was also invited for his solo in 1990, 1992 in Fo Guang Temple at Singapore and Taiwan. 4) SJBA is hosting a Dhamma Talk by Venerable Sujatha on 24 Sept 2014, Wednesday, 8.30pm to 10.00pm. Venerable Sujatha entered the monastery at the age of 11 and graduated from the Subodharama International Monk Training Center. In 1993, he left Sri Lanka for Australia, where he taught meditation and Buddhism at the Sri Lankarama Buddhist Monastery in Brisbane. In 1997, he helped establish the Great Lakes Buddhist Vihara in Southfield, Michigan. In 2002, Venerable Sujatha was invited to start meditation classes at both Congregational Unitarian Church in Woodstock, Illinois and McHenry County College. Soon after, Venerable Sujatha founded the Blue Lotus Buddhist Temple in Woodstock, Illinois, at the premises where the Congregational Unitarian Church once stood. As the Abbot of Blue Lotus Buddhist Temple, Venerable Sujatha travels around USA and abroad to teach the Buddha Dhamma and Meditation, and regularly devotes his time in Sri Lanka in aid of several missionary and charity projects. Venerable Sujatha has been a Buddhist Monk for over 30 years, and is singularly focused on adding more love and bringing happiness in the world. He teaches loving-kindness meditation to people around the globe for all those seeking the art of happiness and contentment. His approach to meditation is deep and profound, yet simple and practical, bringing core Buddhist teachings to everyone in a way that is practical and easy to understand. A joyful, radiant, funny and wildly energetic monk, Venerable Sujatha will help anyone obtain peace and tranquility that can only be found in deep silence. Director. This Program will be sponsored by SJBA and the Hong Kong Society of Dhamma Supporters but donations towards the costs of running this Novitiate Programme will be most appreciated. Please visit SJBA website or Facebook (as below) for further information and downloading of application forms. 1) In conjunction with the Mid-Autumn Festival, SJBA is organizing a Mooncake Family Night on this Saturday, 6th September 2014. It will be a fun-filled night to celebrate with your family, especially so if you have young children as SNOWBALL THE CLOWN is around to entertain you with magic show and ventriloquism with his puppets. And in line with SJBA’s effort in promoting a caring and compassionate community, we are inviting underprivileged children from Ti-Ratana Welfare Society to join us in our celebration. These 40 underprivileged children have provided us with a wish-list. So all members and devotees who want to fulfill their dream, please contact Sis Lily at 03-56348181 / 56315299 for the items they have wished for. Last but not least, remember to bring your lantern along for the traditional lantern procession round the temple to end the night. DINNER WILL BE SERVED, however we encourage you to bring some desserts to share with everyone. 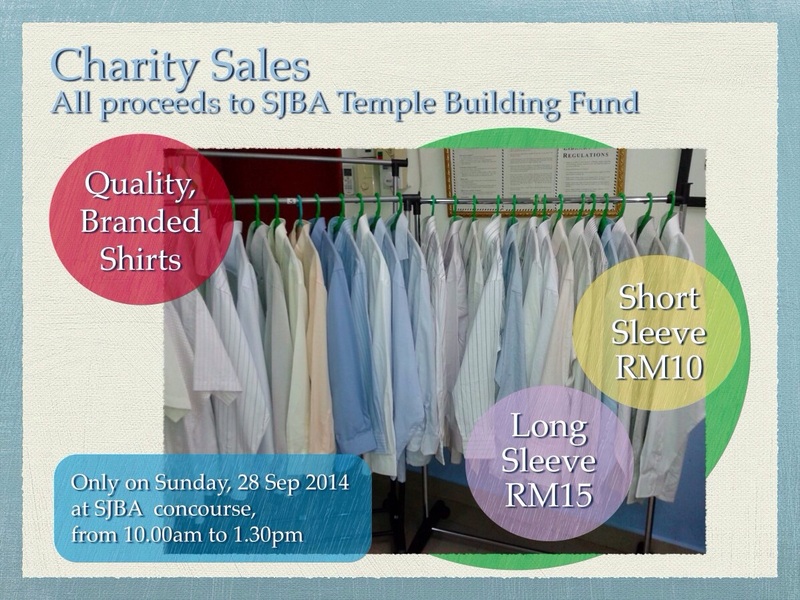 So please bring your family and friends along to SJBA on Saturday, 6th September 2014 to join us in our fun-filled celebration. 2) SJBA is hosting a Dhamma Talk “Metta To Heal All Wounds” on 10 September, 2014, Wednesday from 8.30pm to 10.00pm. The Talk will be given by Meditation Teacher, Mr. Upul Gamage from the Nalambe Meditation Centre, Kandy, Sri Lanka. He teaches meditation at monasteries, hospitals, prisons and schools. He travels regularly to Europe and Hong Kong to give Dhamma Talks and conduct meditation sessions. He is a student of one of Sri Lanka’s best-know meditation teachers, the late Acharya Godwin Samararatne. 5) The Metta Class in Mandarin conducted by Ven. Dhammapala will be on every Friday, 8pm to 10pm. 10) This Sunday’s (7/9/14) Dhamma Dhamma Talk in Mandarin (at 11.45am) is on “Meeting With the Dhamma” by Ven. Dhammapala. Ven. Dhammapala graduated in Pali and Buddhist Studies from the University of Kelaniya, Sri Lanka and received his Doctorate from the University of Hong Kong. He has been lecturing in the University of Hong Kong and has presented a number of papers. He is currently the Spritual Director of Buddhistdoor. Vice Chairman of the Hong Kong University Centre of Buddhist Studies Alumini Association and Director of a few Buddhist-based organisations. 这个星期日(7/9/14, 11.45am) 的讲题是与佛法相会, 讲师是法护法师. 法师毕业于斯里兰卡的Kelaniya大学，专注于巴利文和佛教研究。法师也在香港大学获得了博士学位，也在香港大学当过讲师，并呈列了一些论文。他目前是 “Buddhistdoor” 佛门的精神理事。是香港大学， 佛学校友会中心的副主席。也是其他以佛教为基础的组织的理事主任. 11) This Sunday’s Sutta Class (7/9/14) in Room T9; from 3.00 to 4.30 pm; conducted by Bro Chan Koon San is on the topic “Dhamma Protection Not Dhamma Protectors” This Sutta class will discuss the various types of protection taught by the Lord Buddha, who is the King of Dhamma (Dhammaraja) with references from the Suttas and Commentary. In the Ratana Sutta and Atanatiya Sutta, reference is made to the Four Great Kings or Catumaharajika Devas. These four mighty kings are indeed the protectors of the world or Lokapalas.